Rasa Sayang is a welcome refuge off the hustle and bustle of Chinatown. Unlike many of the other restaurants, this has more of a café feel – there are no dead rich-brown ducks hanging in the window or waiters loitering outside tentatively clinging onto menus. Rasa Sayang is cooler than that. In a way that they don’t quite realize yet. I had to act fast – as soon as this dish was set down, the gannets were on it. Rasa Sayang means ‘Feeling Love’. And it’s true – there is a lot of love for this restaurant that specializes in Malaysian / Singaporean food. They don’t do dim sum, nor crispy aromatic duck, nor any of the mainstream foods that most of the restaurants in China Town seem to offer. This is what I love about them. They have stuck with dishes that they’re good at. And that’s why I come back. Often with friends. And family. And anyone else I can drag along. Being half Singaporean, I naturally have a soft spot for Rasa Sayang. When I went recently with my mum and sister, I diverged from my usual Hainanese Chicken Rice (OMG, it’s the best dish ever) and bravely expanded my culinary horizons to order the Beef Rendang Curry. I wasn’t disappointed, there were huge chunks of soft beef in hot, rich sauce. In fact, I’m not sure what happened that lunchtime but my usually reserved sister threw caution to the wind and bold ordered several starters. 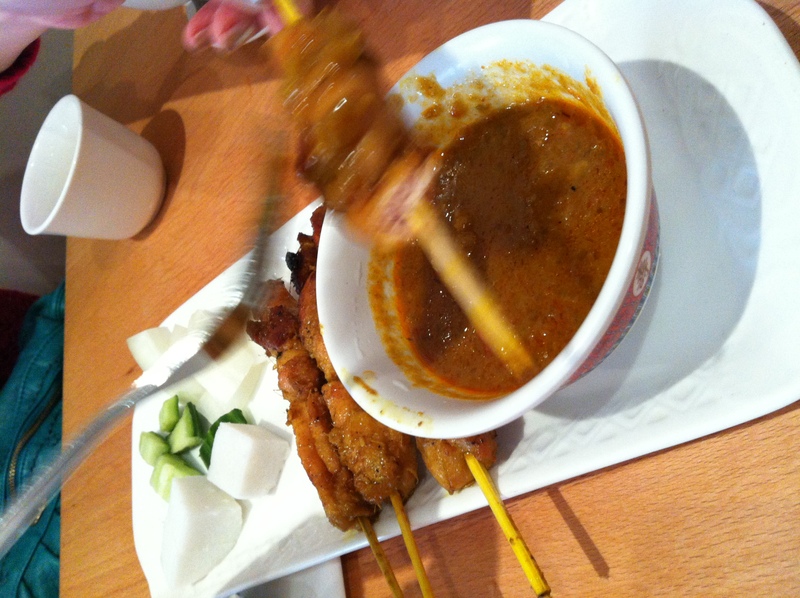 The chicken satay was juicy although the peanut sauce was a little on the runny side. However, we forgave everything as soon as the Roti Canai appeared – flakey yet stretchy pancakes with curry sauce. The Otak Otak, fish paste with spices served in banana leaves, were moist and great served with a spoonful of rice. Mum had a bit of a problem with her Seafood Hor Fun, mainly because it was so gigantic. Needless to say, she finished it. If you have time, make sure you try the Kueh Dadar which is pandan flavoured pancakes filled with coconut and brown sugar – don’t let the green put you off, it’s delicious, I assure you! Whilst the service at Rasa Sayang is prompt, it’s not unfriendly. In fact, the only unfriendly faces you’ll be most likely to see are the hungry diners queuing up outside chomping at the bit to sit down and eat. Price: £45 for three people including starters and drinks. What to wear: Anything goes. 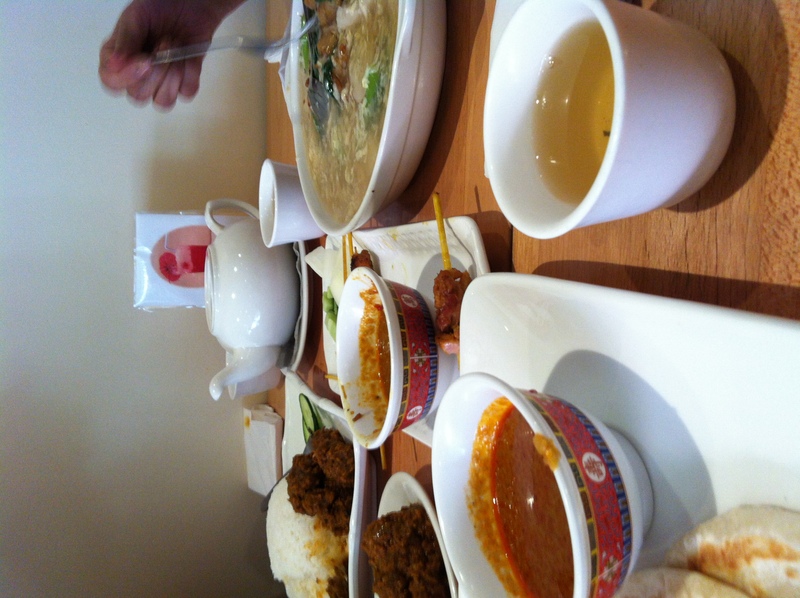 Best for: Quick food that’s authentic Singaporian and Malaysian. And cheap. Best bit: Beef Rendang Curry, Hainanese Chicken Rice and Roti Canai.